a Performance Bowling Green and Money in the Bank! To finally play on the Smooth, True and Fast green you’ve always wanted, Performance Bowling Greens is the ultimate practical guide. Performance Bowling Greens is the simple step by step eBook that shows you exactly how to create a bowling green that performs to tournament standards consistently. Written by a Master Greenkeeper speaking from over 3 decades of experience and knowledge. 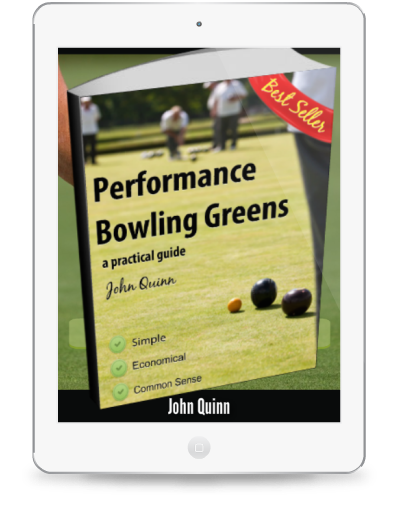 In a few minutes from now you can be reading our best selling eBook: Performance Bowling Greens…a practical guide by Master Greenkeeper John Quinn and it will transform your bowling (and greenkeeping) experience. Read it on any device including your desktop computer, laptop, iPad, tablet or phone. Print it out in full or just the pages you need right now if you want to make notes down at the green. Save your Bowling Club £hundreds in Maintenance Costs, every year! Every year bowls clubs everywhere spend a sackful of cash on greenkeeping. A lot of that expenditure is not just unnecessary; in a lot of cases it is actually making the green worse into the bargain. After 36 years as a greenkeeper and adviser to clubs, the author John has developed a program that works. A program that is not just good for the green and the sport of your members, but one that saves clubs money on greenkeeping expenses too! NOW comes with HALF PRICE SOIL ANALYSIS! In our best selling eBook, Master Greenkeeper John Quinn explains a program for the recovery and transformation of any bowling green into a high performance green. This eBook will change your mind on how bowling greens should be maintained for ever. Includes annual maintenance schedules. 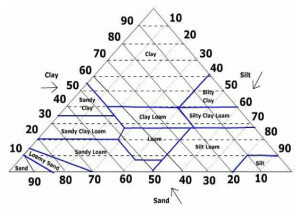 more details Soil analysis offer valid in UK only. For less than the cost of a cheap bag of fertiliser you are about to have the most valuable 100 pages of greenkeeping information available anywhere, in your own hands. You can start applying this knowledge immediately, regardless of the season. You can feel safe in the knowledge that you’ll be improving your green for good and saving your club substantial wasted time, effort and money! Performance Bowling Greens, a practical guide is available for immediate download NOW! and right now, this is the definitive guide to achieving the level of bowling green performance you previously only dreamed of. You’ll be amazed at what you find Inside your copy of ‘Performance Bowling Greens, a practical guide. John, blows away all of the commonly held myths about bowling green maintenance that have left you with not only a disappointing green, but also a lot of mis-information about greenkeeping that has continued to hold you back from creating the green you want. Inside this 100 page eBook, written in John’s easy to follow, conversational style, you will discover what is actually going on under the surface of your green so that you can easily measure progress at each step of the way. 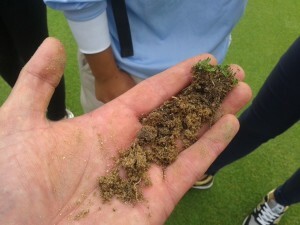 Soil science and plant physiology are introduced and explained in a way that makes these vast and often difficult subjects easily accessible to the amateur greenkeeper. You’ll never be stuck for knowledge on what products, techniques or equipment to use either, as John covers these in detail. You’ll be surprised, annoyed or maybe even furious when John shows you how the majority of problems experienced on bowling greens are related very closely to just one common maintenance assumption (mistake) that nearly every bowling club makes every year. The turf maintenance industry doesn’t want you to know about this one! Since its launch, Performance Bowling Greens has become by far the best selling of our titles here on Bowls Central. As a Bowling GreenKeeper, even if you’re just starting out, like hundreds of other readers you will just click with this book as it leaves you with a comprehensive plan for your future maintenance, that will not only result in a high performance green, but will actually save the majority of UK clubs money on their maintenance bills. John provides all of his readers with a uniquely personal email support system. Many email newbies have realised that they need to check their inboxes more regularly. A question about bowling green maintenance to John usually triggers a fast and comprehensive response, often catching readers out with the speed and depth of reply. Readers routinely send John photos to look at and problems to solve, including questions on machinery, techniques, materials and products. So as you can see, ‘Performance Bowling Greens, a practical guide’ is a very important resource for bowling clubs , but what we’ve told you so far really is just scratching the surface. This ebook is also packed with tips and observations from John gleaned from 3 decades of greenkeeping experience. All of the information is put across in an easy to read, conversational style, with explanations and diagrams for the more complex issues. 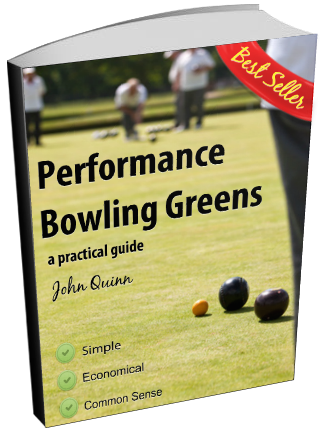 Get your copy of Performance Bowling Greens instantly by clicking on the Buy Now button below. Have been reading up on bowling green maintenance for over 20 years and John's "Performance Bowling Greens" is the best one. It is easy to read and understand as well as unravelling those old myths and stories that seem to always permeate Bowling Clubhouses. Having bought and read the book at least twice it gave me the confidence to take on the Green Conveners role at Portland Bowling Club in Kilmarnock and it has helped in beginning to see positive improvements in our greens as we introduce the concepts. We are in our second year of following your High Performance Bowling Green recommendations. Both our greens have performed exceptionally well to the point that we have held 4 finals of the Wakefield and District Crown Green Bowling Association on our 2 greens. I have had lots of comments from visiting teams commenting on how good the conditions of our greens are. I recommended that they follow your advice to the letter to achieve similar results. I purchased the Book in 2016 and it was a revelation to me as I had only just taken up the role of Green Manager for our Bowls Club and to be fair knew nothing. This book explains everything in clear understandable detail, even for a novice. I have used the book to ask intelligent questions when discussing the green with our contractors and between us have challenged and modified some long held practices. The results in even a year are incredible and everyone who sees the green now comments on the improvements. I am very grateful to John Quinn and his team for speedy replies to questions and sound advice on how to proceed. Even our professional contractors have appreciated the support from Bowls Central. I can heartily recommend the book to anyone with an interest in maintaining a good high quality Green. We started with the purchase of John's ebook at the beginning of 2017 having previously decided that our green was "not fit for purpose" in 2016. Having got our heads around the basic concepts of his program via the ebook we immediately had a soil analysis carried out after which we received his bespoke green maintenance program which we have followed to the letter. The results have been outstanding and the club membership is full of praise for the small team of members who carry out the work on the green. Although we still have a way to go we already have a green that we are proud of and anticipate it improving further with each passing season. I would stress that the book and the program are only the starting point and a major benefit is that John has this incredible way of personalising his program by responding with amazing speed and comprehensiveness to email questions that make you feel like you are the only club he is dealing with. I cannot praise him and his program highly enough - so well done John, It's a joy to work with you. I am an experienced green keeper working at a 45 hole golf complex who looks after a bowling green in my spare time. I was introduced to this refreshing concept of greenkeeping several years ago, Johns Ebook is both informative and convenient. The concepts at the heart of this program are no brainier and are transferable to other sports surfaces as well as bowling greens. I purchased this ebook as I have recently taken over as greenkeeper at our club, with absolutely no experience! I feel that after reading it I have a much better understanding of the problems we have and a solid plan on how to tackle them. I have contacted John by email a few times and his replies have always been very quick and he has answered my questions fully. Cant wait to see the results!